Part mystery, part fantasy, part Vegan lifestyle book, part cookbook. Both the charm, and the problem with this book is its multiple focal points. Zoe Faust is centuries old but continues to move and re-introduce herself to new surroundings as her own grand-daughter. Currently, she is a new resident to Portland, Oregon, but among her bags is a three-and-a-half foot gargoyle. Alive. And the gargoyle, Dorian Robert-Houdin, needs Zoe’s help… the sort of help that Zoe is trying to put behind her … her work with alchemy. In exchange, Dorian helps Zoe wherever he can, including cooking up some new Vegan recipes for her. Dorian and Zoe very quickly get involved with a local teen, Brixton, and a man is found dead on Zoe’s porch. Portland Detective Max Liu has Zoe as one of the prime suspects, especially once she talks about the man being poisoned before the coroner’s report. The teen and his friends have some secrets and the detective becomes interested in Zoe in more than just a professional manner, and Dorian is in danger of reverting to stone permanently if Zoe can’t recover a lost alchemy book. Zoe’s becoming a person of interest in a murder case is the much more interesting complication in the book, but this becomes resolved much too easily and quickly to make it more than a simple annoyance. I am interested in the continuing stories with Zoe and Dorian (and Brixton and Liu), but I do hope that future stories have a bit tighter focus. Looking for a good book? 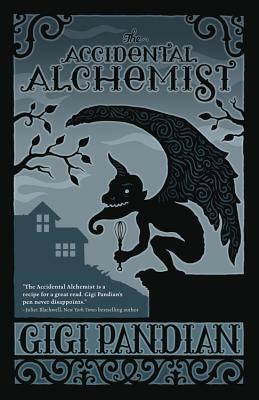 The Accidental Alchemist by Gigi Pandian is a fun little mystery that reaches out to a very specific niche market, and needs a little tighter focus, but shows some nice potential for future stories.